Hope you are all well! I updated my ESL site the past week, helped people with TOEFL review, and worked on drawing the diagrams and figures on the computer for organic chemistry so that kept me busy in terms of the past few weeks. Some news regarding medical law and ethics, the powerpoints can now be accessible after I finish the handouts for each chapter. If you look at the updates page on my site, Chapters 1 and 2 are now accessible for download and review. Thank you all for your support! As I stated earlier, the survey of organic chemistry and biochemistry handouts will provide people with a foundational overview of these topics. If you’re studying or working in health sciences, these are targeted for you. The handouts for organic chemistry focusing on biological applications go into greater depth if you plan to go into research, grad school, or for those who are applying to medical school. Since the bonds in alkanes consist of only nonpolar carbon-carbon bonds (C─C) and carbon-hydrogen bonds (C─H), weak London dispersion forces are the intermolecular forces that hold them together. London dispersion forces are temporary attractive forces formed as a result of the constant motion of the electrons within molecules. When the electron distribution is averaged over time, their distribution is symmetrical. However, at any instant one end of the molecule may have more electrons than the other which gives the molecule temporary polarity. As the size of straight-chain alkanes increases, their melting and boiling points increase. Alkanes are nontoxic, colorless, tasteless, and have no odor or a mild odor. As discussed earlier, alkanes are nonpolar. They are soluble with nonpolar organic solvents and are insoluble in water. Alkanes are less dense than water which results in them floating on the water’s surface. We will see in the next section that alkanes are flammable when we examine combustion. Physiological effects: although alkanes are relatively nontoxic, suffocation can result from a lack of oxygen. Vapors of higher alkanes can induce loss of consciousness when breathing in high concentrations. Since alkanes are nonpolar, breathing in the droplets of liquid alkanes can dissolve nonpolar substances in lung tissue resulting in pneumonia-like symptoms. Alkanes have low chemical reactivity and are not reactive to most common laboratory reagents such as acids and bases. Under certain appropriate conditions, alkanes react with oxygen (combustion) and halogens (halogenation). When an alkane such as methane reacts with oxygen, carbon dioxide and water are formed as products. Heat is also released during combustion. The incomplete combustion of a hydrocarbon results in carbon monoxide and carbon-containing soot as products. While carbon dioxide (CO2) is nontoxic and harmless (only posing a problem if there is a high concentration leading to suffocation), carbon monoxide is deadly. Inhaling moderate amounts of carbon monoxide in air (even as little as 2% CO in the air) for prolonged periods of time can lead to damage to the respiratory and nervous systems or death. This is because of carbon monoxide’s ability to strongly bind to hemoglobin molecules in the blood. As a result, oxygen can’t bind to the site where it normally binds to hemoglobin due to the carbon monoxide. Hemoglobin is prevented from carrying oxygen to tissues, and organs such as the brain do not get their supply of oxygen. When a hydrogen in an alkane reacts with a halogen (such as chlorine or bromine), the reaction is called halogenation. The process is initiated by heat or light. The halogenation of an alkane yields an alkyl halide (haloalkane). Halogenation focuses on chlorine and bromine since iodine isn’t very reactive while fluorine is explosively reactive. Halogenation involving chlorine (chlorination) and bromine (bromination) are generally exothermic. In these situations, the focus is on converting a reactant to a specific product. As a result, minor products (such as the HCl above) are not important and won’t need to be considered. The equations also don’t have to be balanced here since the focus is on showing the reactant, major products, and necessary conditions and reagents required to proceed. The alkanes we had discussed are open-chain (acyclic) organic compounds. Now we will look at alkanes composed of a ring of carbon atoms which are called cycloalkanes. Cycloalkanes require an additional C─C bond with a loss of two hydrogen atoms as a result. The formula for cycloalkanes is CnH2n. When drawing cycloalkanes, polygons are used to represent them. The following are a few examples, but the list goes on beyond cyclooctane. So far we would write out the structures of the alkanes (e.g. condensed structures). When we look at Figure 1.3a above, we do not explicitly see the carbon and hydrogen atoms written out. Line structures are another shorthand where the carbon is understood from the intersections and then mentally adding the appropriate number of hydrogens. Let’s look at cyclopropane above. When we take one of the intersections, we understand that there is a carbon in each intersection. Since carbon is tetravalent (always forms four bonds), we mentally note that the carbon is already attached to the two other carbons so there are two hydrogen atoms bonded to each carbon. When we use the formula above, it verifies this case. Cyclopropane’s formula is C3H6. This is very helpful and efficient because once we get to biochemistry and examine larger organic molecules, it will be time consuming, confusing, and difficult to document each carbon and hydrogen. Cyclic and acyclic alkanes share similar properties. The simpler cycloalkanes such as cyclopropane and cyclobutane are gases while larger cycloalkanes are liquids and solids. We learned in the previous handout that the carbon atoms in alkanes have a tetrahedral structure. The bonds are identical and the bond angles are near 109.5°. The values are compressed when the rings are flattened for cyclopropane and cyclobutane. The C─C─C bond angle for cyclopropane is 60° and for cyclobutane it is 90° which are compressed from the normal 109.5° tetrahedral value. This results in cyclopropane and cyclobutane being less stable and more reactive than the other cycloalkanes. 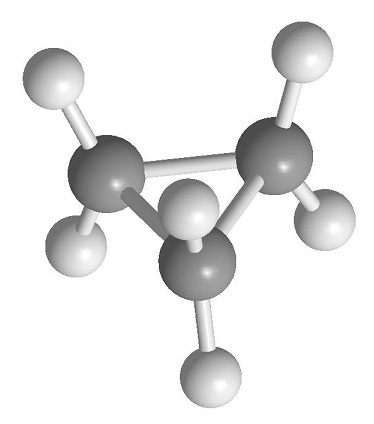 When we look at cyclopentane and above, the bond angles are closer to the ideal tetrahedral value and are more stable. The properties we had discussed regarding alkanes are also similar to cycloalkanes such as being nonpolar, flammable, and insoluble in water. However, since cycloalkanes have cyclical structures, they have less flexibility and more rigidity than the acyclic (straight-chain) alkanes. In Figure 1.3a above we named a few cycloalkanes from the simplest cyclopropane with 3 carbons to more complex ones such as cyclooctane. 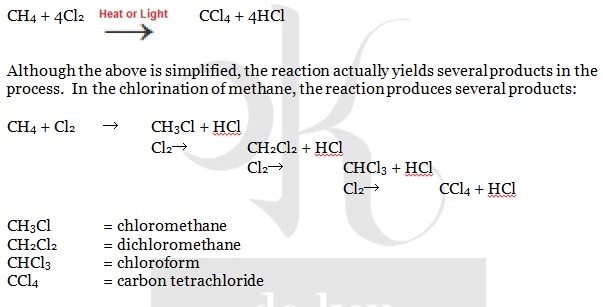 In the previous handout, we examined in detail how to name straight-chain alkanes. The rules are similar (such as alphabetical priority when naming) with only a few additional steps to keep in mind. Compounds are named as alkyl-substituted cycloalkanes. This means that the substituents are written before the cycloalkane. This would be methylcyclopentane, not cyclomethylpentane. The cycloalkane name is used as the parent. In Figure 1.3a, we saw a short list of common cycloalkanes. In our current example, cyclopentane is the parent. When there is only one substituent (like in our example above), you don’t have to specify the number (i.e. 1-methylcyclopentane) since the positions are all the same. If you attach the methyl group to any of the other positions in cyclopentane, you will still end up with methylcyclopentane. When there are additional substituents attached to the parent compound, then assigning numbers will be necessary. Identify the substituents and assign them a number. Similar to straight-chain alkanes, the substituents are named based on alphabetical priority (e.g. 1-ethyl-4-isopropyl- or 1-isopropyl-2-methyl-). The number 1 is assigned based on alphabetical priority. In our example from the previous sentence, the ethyl group gets assigned the 1 in the first part and the isopropyl group is assigned the 1 in the latter. From there, move around the ring to give the next substituent the lowest possible number. Let’s look at an example. 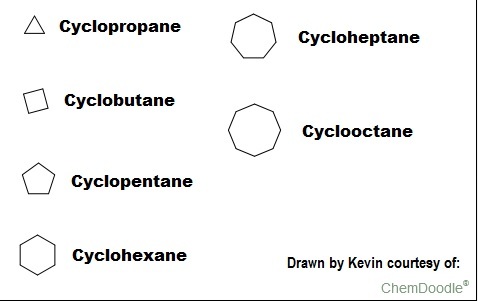 This is the correct way to name cycloalkanes. Identify the parent compound. We note that it is cyclohexane since there are six carbons. Identify the substituents attached to the parent compound. We note that there is an ethyl group and a methyl group attached to the cyclohexane. Assign the priority number (1) to the substituent based on alphabetical priority. We identified the ethyl and methyl groups attached to the cyclohexane. 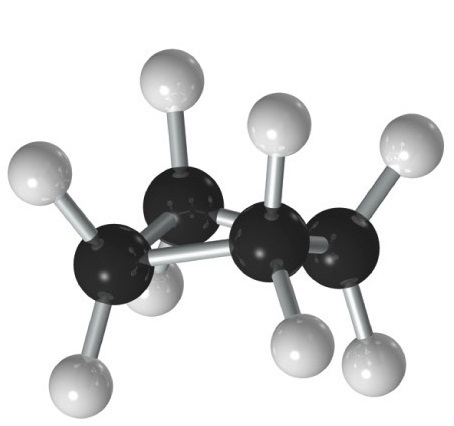 Since “e” comes before “m” in the alphabet, ethyl is assigned the number 1. 4. Move around the ring to give the next substituent the lowest number. In Figure 1.3b, we move to the left (counterclockwise) because it gives methyl the number 3. Please be careful not to do this! If you count to the right and go clockwise, the methyl group will be assigned “5” which is not the lowest possible number. This is incorrect and will give 1-ethyl-5-methylcyclohexane. Also keep in mind the alphabetical priority. Another mistake can be 1-methyl-3-ethylcyclohexane (mistaking alphabetical priority) or the completely incorrect 1-methyl-5-ethylcyclohexane (mistaking both alphabetical priority and numbering). Similar to the open-chain alkanes, if there are similar substituents attached to the parent compound, you use similar prefixes (di-, tri-, etc.). We discussed earlier that we don’t have to add a 1 if there is only one substituent attached to the parent compound. However, we have two substituents in the above example. We can’t just say “Dimethylcyclohexane” since we wouldn’t know where the location of the second substituent is. The possibilities can be “1,1-,” “1,2-,” “1,3-,” or “1,4-,” dimethylcyclohexane. This is why it is necessary to note the proper position of each substituent. This concludes the general overview of alkanes. In the next handout we will start examining alkenes, alkynes, and aromatic hydrocarbons (arenes). Many of the rules that we learned in these first three handouts are important as we progress. You will see that the rules will continue expanding from the foundational rules from the introduction to orgo and alkane handouts. Next time, we will examine topics such as cis-trans isomerism and organic reactions (addition, elimination, substitution, and rearrangement).